St. John’s University has two residential campuses. They are in Queens and Staten Island, New York City’s most suburban boroughs. Only 11.6 miles from Manhattan, our Queens campus is near LaGuardia and John F. Kennedy International Airports. Our Staten Island campus is a 30-minute ferry ride to Manhattan. St. John’s also has a state-of-the-art 10-story “campus” in Lower Manhattan’s East Village. 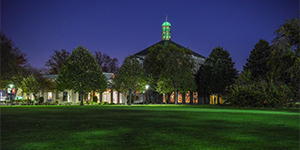 Colleges, Programs, and Degrees: St. John’s College of Liberal Arts and Science, School of Education, Peter J. Tobin College of Business, College of Pharmacy and Health Sciences, College of Professional Studies, and School of Law; please visit stjohns.edu/majors for a list of programs and degrees. International Student Services: English as a Second Language; international orientation; International Student and Scholar Services Office offering guidance on immigration, employment, on-campus living, etc. Financial Aid: St. John’s students can be awarded academic scholarships ranging from $5,000 to full tuition. Additional application scholarships are also available for international students. Contact the Office of International Admission for more information on all scholarship opportunities. Application Deadlines and Fees: Early Decision, November 15; Early Action, December 1; rolling admission thereafter; priority given to those applying by February 1; Doctor of Pharmacy regular deadline, February 1; other program-specific deadlines may apply. 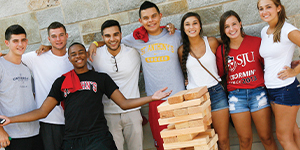 Home to nearly 1,200 internationalstudents from 116 countries worldwide, St. John’s University has positioned itself as a top private Catholicinstitution recognized for its exceptional diversity, academic leadership,and financial generosity to international students. Its gated Queens and Staten Island campuses are located in residential suburban communities, with Public Safety on campus available 24/7. Both campuses offer accessibility to Manhattan—one of the world’s largest cultural, business, and economic hubs—within minutes. In addition, St. John’s also has locations in Rome, Italy; Paris, France; and Limerick, Ireland. St. John’s University offers its students more than 100 bachelor’s, master’s, and doctoral degrees in sevendistinguished divisions, making it atop contender for international and domestic students alike. St. John’s offers merit scholarshipsto qualifying international studentsthat require no additional application. Awards range from $5,000 per year to full tuition for four years of full-time undergraduate study. In addition, opportunities for application scholarships for international students range from $2,500–$10,000 per year for up to four years of continuous, full-time undergraduate study. An online application is required with a deadline to apply of January 15. Learn more at stjohns.edu/scholarships. At St. John’s, they know that being healthy and being successful go hand-in-hand. Numerous student resources are available for support, and the refreshed on-campus Fitness Center is one way we keep your health and wellness easily balanced and is conveniently accessible. St. John’s offers more than 180 student organizations that celebrate the educational and cultural richness of the University, active CampusMinistry, and the excitement of our Division I Big East men’s and women’s athletic teams. The men’s Red Storm basketball team’s home court is the world-renowned Madison Square Garden. With Manhattan only a short train ride away and authentic cuisine from all over the globe at every turn, it’s not hard to get a sense of home whenever the mood strikes. The helpful Campus Concierge completes any outing with tickets to the newest Broadway show, often at a discounted rate. Career services are central to a St. John’s education, and the vast alumni network of 184,000 offers extensive internship and unmatched jobopportunities at leading companies around New York City and the world. All international students enjoy personal support throughout the enrollment process from the Office of International Student and Scholar Services. The University Freshman Center was created to fulfill the commitment made by St. John’s University to mentor and guide first-year students from all over the globe with their transition from high school to college. Its mission is to welcome each and every student into the St. John’s community and support their overall transition, acclimation, and integration into the University setting in New York City. St. John’s is committed to students’ success, so it offers an extensive support system, which includes The Language Connection (TLC). TLC offers English as a Second Language courses, ranging from beginner’s to university preparatory level. For more information, email esl@stjohns.edu or visit stjohns.edu/tlc. If at all possible, apply early. Even though rolling admission is offered, some programs close and there are limited full-tuition scholarships. Send transcripts and test scores directly to an international counselor after applying online. Take the first step toward securing a successful future with St. John’s by contacting the Office of International Admission. * The data here is representative of three graduating classes (September 2016, January 2017,and May 2017) from the three main campuses(Queens, Staten Island, and Manhattan). The data provided here pertains only to those 72.7% of undergraduates who responded to the survey.